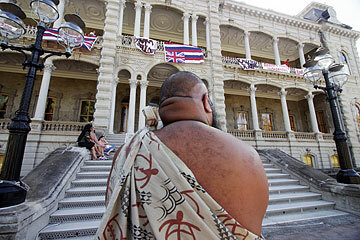 Members of Hui Pu, a coalition of native Hawaiians opposed to the Akaka Bill, stated a symbolic reclamation of the royal throne yesterday at Iolani Palace. While federal lawmakers debated the merits of the Akaka Bill, about two dozen native Hawaiian activists chanted, sang and hung banners and upside-down state flags from the second floor of Iolani Palace to protest the action being taken in Washington. Members of Hui Pu, a coalition of native Hawaiians opposed to the federal recognition proposal, staged a symbolic reclamation of the royal throne before leaving peacefully after about two hours. "We're doing this because of the Akaka Bill vote," said Hui Pu member Ikaika Hussey, one of the organizers of the rally. "The way it's going through, the process is anti-democratic." Hui Pu has criticized lawmakers and the Office of Hawaiian Affairs for not holding more extensive hearings on the bill, which has been revised over the past six years. 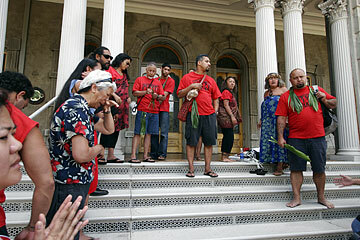 People opposing the Akaka Bill, protest with civil disobedience by occupying Iolani Palace for about 2 1/2 hours. This is Hanalei Colleado looking up at the protestors on the balcony before he heads up to join them. Hawaiian sovereignty activists also oppose the bill, saying it does not do enough to grant independence from the U.S. government. OHA Administrator Clyde Namuo said the bill is needed to protect programs and preferences that already exist for native Hawaiians. "I think they (critics) need to look at what the bill does," Namuo said by telephone from Washington, D.C. "I think they need to understand what the legal challenges could possibly be if this bill does not pass. "I think people are fooling themselves if they think there will not be further legal challenges." Namuo said he was optimistic that today's scheduled vote on cloture -- a move that would bring the bill to the Senate floor for a vote -- would turn out positive for supporters. He praised Alaska Republican Sens. Ted Stevens and Lisa Murkowski for their arguments yesterday in support of the bill. While some Republican critics said a native Hawaiian government would be a step toward secession and the breakup of the nation's unity, Stevens recalled hearing similar fears in the past when Congress discussed extending land and programs toward Alaska natives. "Time has proven them wrong," Stevens said. "This bill will fulfill our federal obligation to these native Hawaiian people." Namuo also credited Gov. Linda Lingle and Attorney General Mark Bennett for their lobbying efforts on behalf of the Akaka Bill. "I think for those people who were on the fence, they might have been impacted," he said. "We'll just have to wait and see." "The Akaka Bill is worthless," activist and former OHA trustee Moanikeala Akaka said through a bullhorn from the second floor of Iolani Palace. "It will hurt the Hawaiian people, not help the Hawaiian people."